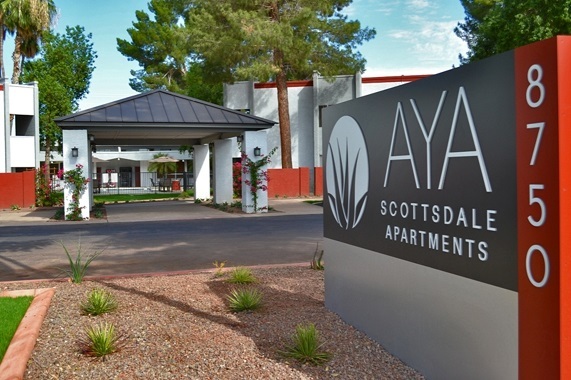 Phoenix, AZ – May 23, 2017 – ABI Multifamily, the Western US's leading multifamily brokerage and advisory services firm, is pleased to announce the $12,450,000 / $99,600 Per Unit sale of the AYA Scottsdale Apartments located in Scottsdale, Arizona. AYA Scottsdale is a two story, garden-style apartment community which rests on approximately 4.0 acres. The property was built of masonry construction with flat roofs and individually metered for electricity. The property boasts an attractive unit mix of 51 - 1 bedroom, 72 - 2 bedroom and 2 – 3 bedroom unit types with a weighted average size of 703 square feet. "AYA Scottsdale offered the buyer a number of strategic advantages," states Royce Munroe, Vice President, who along with Rue Bax, Senior Managing Partner, were the lead brokers for this transaction. "First, the Buyer was seeking a property in a solid performing submarket with potential for increased rents via ongoing property upgrades. Second, the Buyer sees South Scottsdale as a solid performing secondary submarket with more room for growth, when compared to the Downtown Scottsdale or North Tempe, which has experienced tremendous new construction activity. The property is less than one mile from ASU's famed SkySong development and approximately two miles from ASU's main campus. As residents have been displaced with all the new high-end development, the Buyer hopes to capitalize on this movement by offering more a premium, renovated property with more affordable rents." "For reasons stated by Royce, South Scottsdale is attracting more and more investors particularly those areas in and around SkySong and the 101 Freeway," states Rue Bax. "The Seller was able to purchase the property in early 2015 and immediately implemented a renovation and repositioning plan which created a substantial value proposition for the Buyer. South Scottsdale, and the area about AYA, is uniquely positioned in the Valley in that it offers tremendous ease of freeway/road access, as well as, near tremendous employment growth while offering rents below that of newer built properties. Tenants, who still want to be close to major entertainment venues, but cannot afford new construction's higher rents, have turned to AYA and properties like it to live." The Buyer is a private investor based in Washington. The Seller is a private investment company based in California. The multifamily brokerage team of Royce Munroe, Rue Bax, Patrick Burch, John Klocek, Ryan Smith and Nathan Bruer represented both the Buyer and Seller in this transation.